FIVE young Cebuano athletes will join the 2012 Asian Duathlon Championships this coming Nov. 25 in Subic Bay. Leading the Cebuanos are Triathlon Association of the Philippines (Trap) developmental team members Yuan and Justin Chiongbian, Nina Francesca Villaba and the Maximo siblings- Luis Miguel and Ana Patricia. This will be the first time for them to compete in such a prestigious duathlon race. Luis is currently a member of the Philippine Junior Cycling team and has recently been included in the Philippine Junior Duathlon training pool. 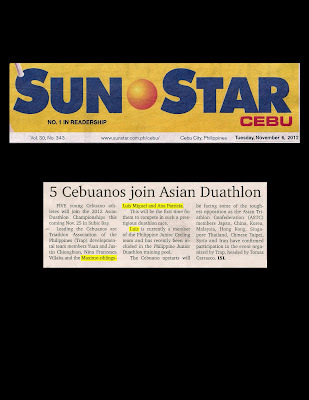 The Cebuano upstarts will be facing some of the toughest opposition as the Asian Triathlon Confederation (ASTC) members Japan, China, Korea, Malaysia, Hong Kong, Singapore Thailand, Chinese Taipei, Syria and Iran have confirmed participation in the event organized by Trap, headed by Tomas Carrasco.